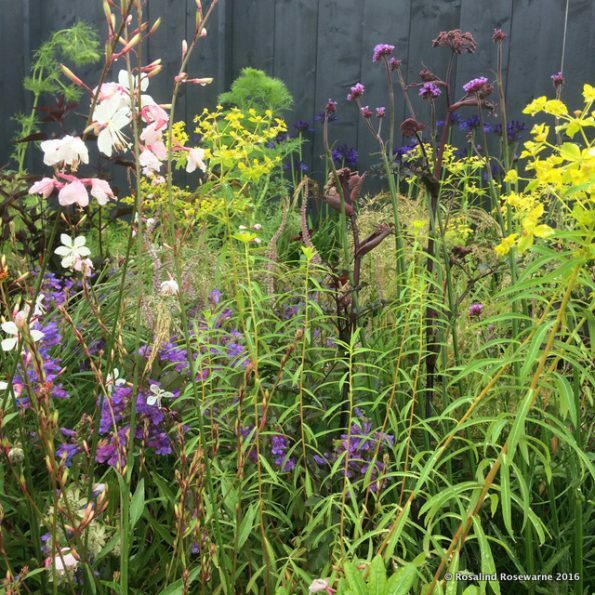 Still catching up with the posts about our RHS Tatton garden, admittedly in a fairly random order! For a first timer there was quite a bit of anxiety around this. From the outset you know precision and meeting your brief are THE things upon which you will win medals, or lose marks. What you realise is that no matter how hard you try to tie down your brief and to deliver that and ONLY THAT, or perhaps that should be at least that, it is almost impossible to guarantee you will. In the main for us it was about plants and the vagaries of growing and being grown for and then there is the weather which obviously affects every single leaf and petal on the plant and the conditions they are subjected to sitting and waiting on a hill top in the few days before judging. First time is the hardest, having done it once, now I know that the wind blows a gale NOT in the direction you think it will be coming from but now you have to take into account the buildings, trade stands and gardens (all temporary) that sit around your space. Preparing for every eventuality is a MUST not a nice to do if you have time. I wasted much time schlepping around local garden centres and supermarkets looking for emergency materials, as cheap as possible, because we were not well prepared for the weather conditions we were faced with. That said I have heard from a number of folk that the 2016 show was by far and away, the worst conditions ever experienced at Tatton shows. Good to know. So as you’re building in record time (12 days end to end) you’re obsessing over every detail, distances, looks, THE BRIEF. “What did we say in the brief ?” became a complete watchword for decision making on site. 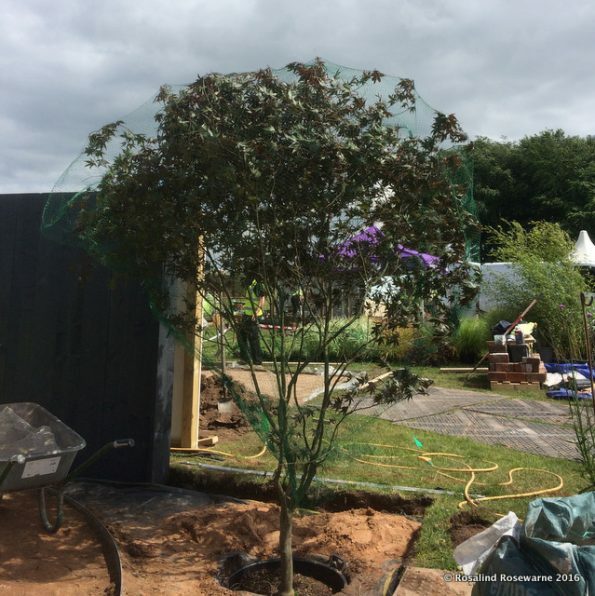 Which in part is a shame because it can stifle on location adjustments, at the end of the day you’re there, as a business, to win a medal as well as make a great looking garden for the public, press and judging teams. So I obsessed. I didn’t make friends at the obsessing stage. When the planting started it was simpler because in the end I mainly set out the main section of plants alone, one whole day on my tod. I was slightly panicky on the time front but once I settled into it I relished the solitude, the pondering, wandering, viewing, adjusting, bringing together, pulling apart, fiddling, moving again, and again, a space in which I could take my own sweet time, create in a way that is indescribably pleasing to any plants person, garden designer or florist I suppose. 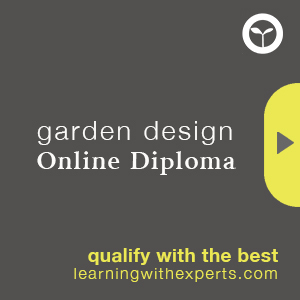 You have worked, reworked and reworked again on paper and in the nursery and on site when the plants arrive, so much so that you can now ‘freestyle it’ and still hit the brief and excel. As a garden designer I almost never plant things when they’re at their best, garden planting is best done in September (ground still warm but plants going to sleep for winter root production phase) or Spring (ground warming up, still time for some root production and a long balmy growing season ahead before the winter cold and wet hit) consequently plants never look too fabulous they day you finish planting. 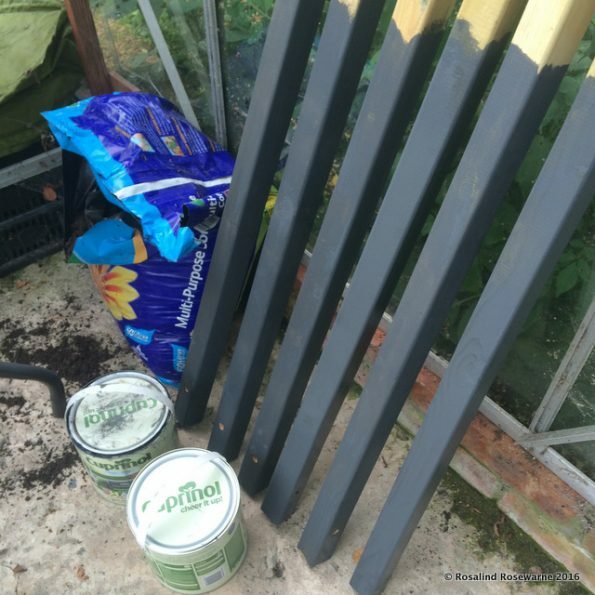 Planting a show garden is entirely different you’re painting with plants at their very peak of performance, and if they are NOT at their peak then they’re off the garden. There was an unexpected moment when I knew intuitively that it was done, it was right, it was finished, a sense of euphoria and rightness. A non physical sigh of relief as the whole space comes together and you’re creative vision is incarnate. Heavenly. As a newbie you can see the end in sight, having done it I now know the end is far away and there are at least a hundred other things to do to be READY for judging, the press and importantly the public. Actually planting – though for this garden we sunk pots and mulched over with Dalefoot’s fabulous claybuster Lakeland Gold, painting posts and sourcing rope for the barrier, collecting flyers, nailing black terram to the back of the boundary, watering again and again, but low down not from above which takes way more time, primping the hard landscape, deadheading and removing dead foliage the list goes on, and on. Our gardens had to be complete for the Sunday walk around by the assessors, judging it turns out is NOT the thing, it’s the assessors visit that is the crucial moment – or moments, we had two assessors visit independently of the group. This is when the medals are decided and changes are made only if substantial differences arise in the assessment panel. We were ready. 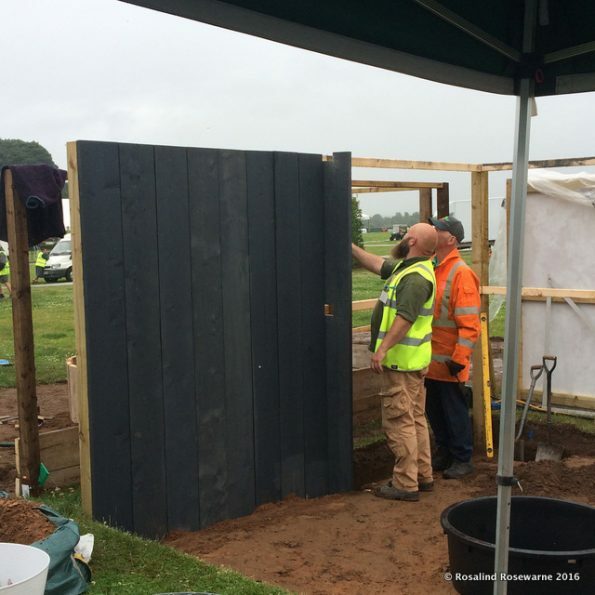 Judging is still nerve wracking, one person from the team can talk for 2 mins to the judges, this is simply to mention challenges and changes that you may have had to make to the garden during the build. It’s only one person but that can be anyone from the wider team even a sponsor. We had some changes, mainly planty. 2 mins is not long and you don’t want to waffle. Being disqualified is a very real possibility if you don’t follow the rules laid down. The judges didn’t stay long with us. Was it a good or bad sign? I couldn’t tell. On Monday morning you arrive to find photographers onsite already and you wonder if anyone has been on the garden. No sign of feet, no sign of disturbance. Later you find that they have because you see images that can only have been taken from inside the garden. They must practice their fairy footsteps like ninja’s. 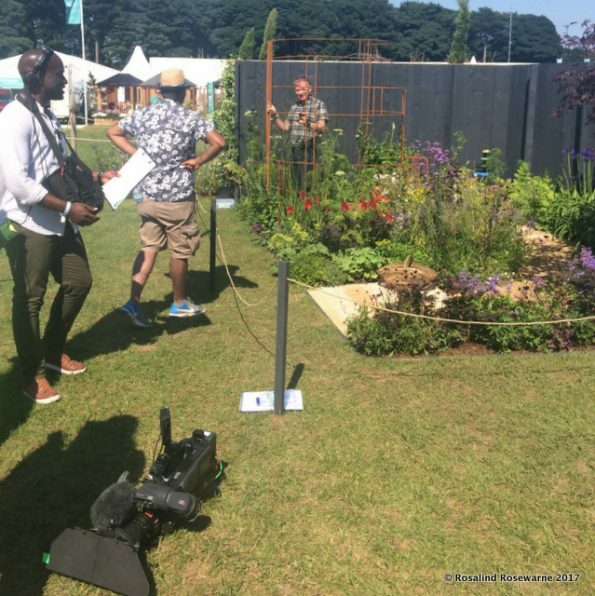 We were lucky enough to have some BBC attention, the garden appeared on the opening sequence about Back to Back gardens. 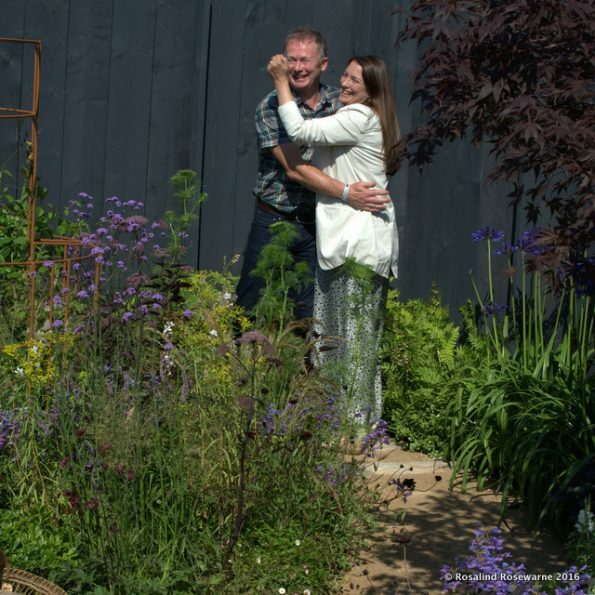 Toby Buckland and Rachel de Thame were on the garden surrounded by cameras and filming teams, great to watch and even better when Mr B says your planting if fabulous, thanks Mr B. 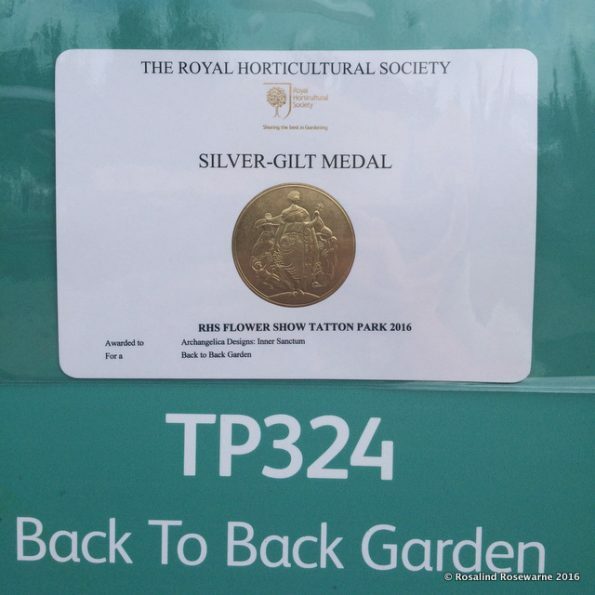 Mid afternoon the RHS come around, swiftly putting up medals on gardens, it’s a very bright day and they all look the same colour from a distance. I hold my breath thinking it’s Bronze, a medal, at least we weren’t disqualified, but as I get to the board I see it is in fact SILVER GILT. Ecstatic. The judges come around later to explain and give out the mark sheet. I know immediately why we have had a mark knocked off, yes one mark off gold. Gutting but fair. 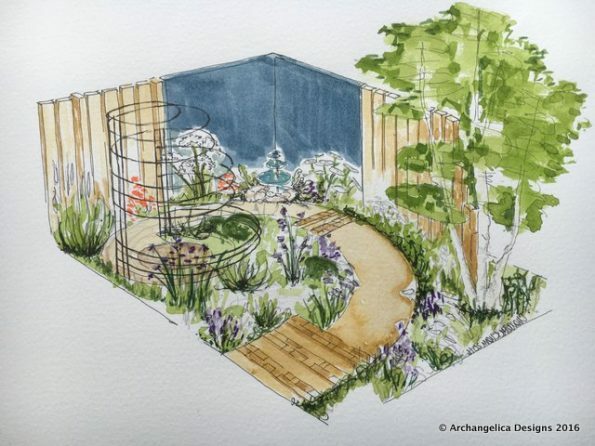 Our neighbour who has received Bronze for what is a beautifully executed garden with a good concept finds out that not meeting the brief is his downfall. very disappointed for him and we are disappointed for him. 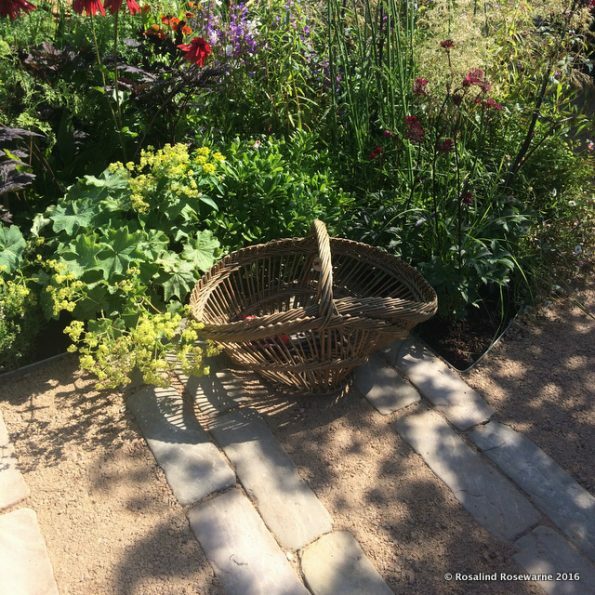 It’s fair to say that you cannot judge a garden by how it looks on show day, if you fail to meet your final brief you lose marks and medals even if the garden is stunning and meticulously executed. I’d love to see the brief published for the visitors so they can see why a garden may not have the medal that they think is fair. 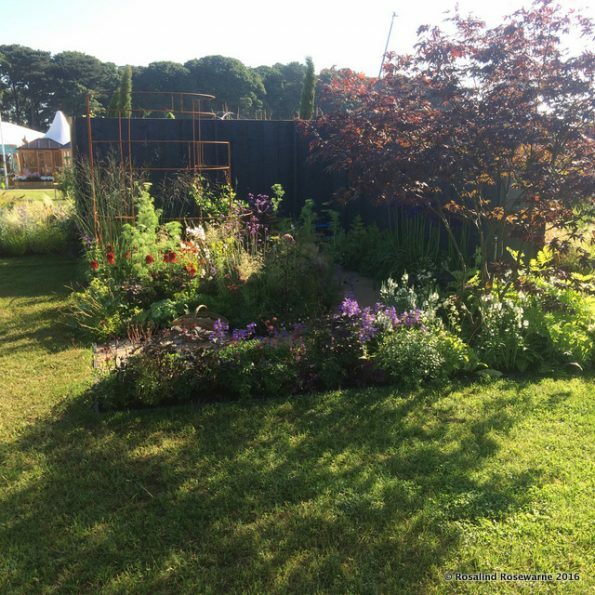 We were lucky to have lots of great comments from visitors about being ‘robbed of gold’ but in the end the judges were right, for our garden at least. Tatton Press day is not like Chelsea it is not thronging with celebrities, though there are some, there is a lot of TV filming and plenty of journalists to talk with but for me it was really the first day to really relax and look at other gardens while wandering around on breaks, talking to other garden makers, even going onto some of the gorgeous gardens that had been made. It was super hot on press day, in fact for show week which led to liberal applications of factor 50, wide brimmed sun hats and watering the plants 3 times a day to keep them looking fabulous. A N D R E L A X…. At the end of press day we put up our barrier rope and posts, filled our baskets with flyers, watered again and got an early night. Readying ourselves for Public opening day.